Established in 1995, le Toy Van designs and produces detailed painted wooden toys. Stylish aesthetics and high play value encourage real learning through imaginative play. 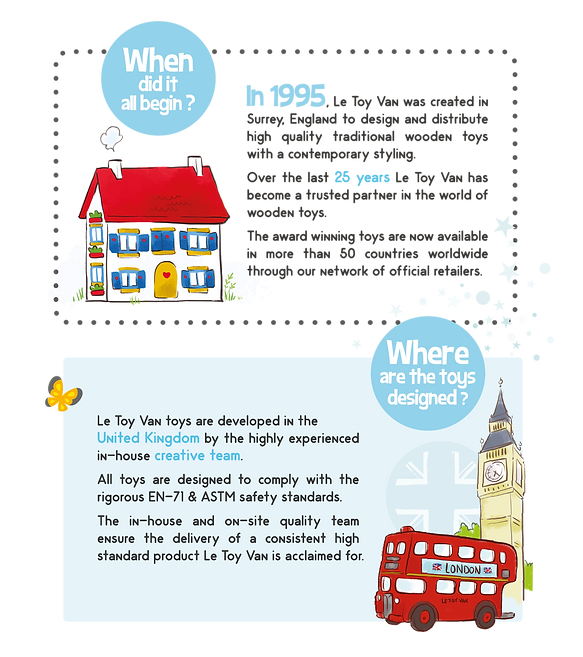 Le Toy Van creates award winning traditional toys in a number of iconic ranges from collectable characters through to classic dolls house. All Le Toy Van toyas are designed in the UK and ethically made using responsibly sourced materials. Le Toy Van toys are safety tested for children age 12+ month, 18+ month, or 3 years. Some of the 3+ toys may contain small parts- choking hazards not suitable for children under 36 months due to the danger of swallowing small parts. Un superbe tapis de jeux Pirate aux nombreux détails pour un moment de jeux encore plus réaliste ! Avec ce petit set d'ustensiles de cuisine, votre petit cuisinier en herbe va se prendre pour un vrai chef !